Palm-fringed beaches, turquoise waters, chili-spiced cuisine, and laid-back, old world beauty. Dive into the turquoise waters of Cancun and explore the underwater museum, Museo Subacuatico de Arte. Visit the ancient famous Mayan ruins of Tulum, snorkel with turtles in Akumal, or spend the afternoon on La Quinta Avenida the town’s main street for dining, shopping and nightlife. In La Paz, anchor in Ensenada Grande with its turquoise waters, white sandy beaches and towering rocky cliffs. Lounge on any of the tiny beaches or stroll the boardwalk shops and tourist piers of the city’s waterfront or Malecon. Enjoy fresh cerviche or sandwiches de chola in the many chichi restaurants, cafes and bars as you take in the old-world beauty and architecture of Plaza Constitucion. In Los Islotos, you’ll find one of the few places you can swim with sea lions in a natural setting. Spend the day kayaking or snorkelling in the turquoise inlets surrounded by pastel pink cliffs in Espiritu Santo. 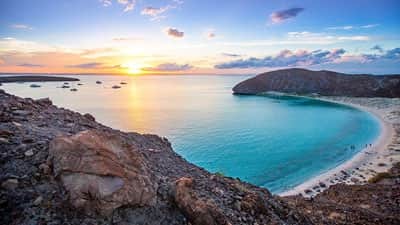 Considered the most beautiful island in the Sea of Cortez, Espiritu Santo is a UNESCO World Heritage with gorgeous surrounding reefs and an array of colourful fish including parrotfish, and angelfish. Wander the pretty cobblestone streets and historic sites of Loreto, a small town on Mexico’s Baja California Peninsula. Mostly untouched by tourists, Loreto offers an authentic, cultural experience, delicious food and gorgeous scenery with mountain, ocean and island views all-in-one. Dine on tasty tortas, chile rellenos and fish tacos, spend the day dolphin and whale watching in Loreto Bay National Marine Park, and take a trip in town to visit the areas oldest mission, the Mision de Nuestra Senora de Loreto Concho.